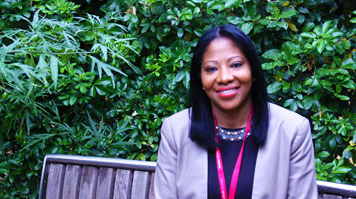 Successful foster carer Pasha Robinson applied to LSBU to develop an area of specialism in her career. "As a foster carer it is important to have a strong understanding of how children develop. The children I work with professionally can often exhibit challenging behaviour and I wanted to explore the reasons behind that from an academic perspective. Whilst I have lots of experience, a qualification in this field would be invaluable in taking my career to the next level." For Pasha, in her early forties, the decision to re-enter education was something she had been considering for a long time. "Naturally I had some concerns about becoming a student again – I thought that everybody would be younger than me, would be better with technology than me and would have better study skills than me. "A family friend recommended approaching London South Bank University, and when I saw that they had a Psychology course specialising in childhood development I knew I had to at least enquire about it. I phoned the course enquiries team and was put in contact with member of staff who taught on the course, who answered all of my questions over email. "I decided to put in an application through that summer, through UCAS' Clearing service. This was very straightforward and went much more smoothly than I was anticipating." All the staff were very helpful and supportive and I was very pleased to be offered a place. Pasha quickly settled in and enjoys life as a mature student. "LSBU provides excellent learning resources, and because the university is open at weekends, I'm able to access these on Saturdays whilst my daughter attends a local dance class. There is also a diverse social mix, with different ages and ethnicities amongst the students. The location is also great, it's ideal for shopping and eating out. "It's also great to have a steady flow of information from the university regarding placements and work opportunities. There's truly something for everybody – whether that is working abroad or in a school – and because the university proactively sends you the details, it really helps to take the pressure off."